A Noh Christmas Carol returns! 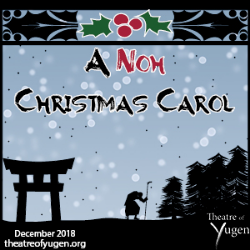 Theatre of Yugen's beloved adaptation utilizes the traditional Japanese theatre forms of Noh, Kyogen, Kabuki, and the avant-garde dance form Butoh to retell the Dickens classic. Sukurooji [Scrooge] receives a visit from his deceased business partner warning him to change his miserly ways or be doomed to linger forever as a hungry ghost. Sukurooji is taken on a wondrous journey by the spirits of Christmas Past, Present, and Yet-to-Come to remind him of the value of life beyond business and profit.